GORDONVILLE – With a little help from a lot of friends, old and new, I’ve made a gold record. 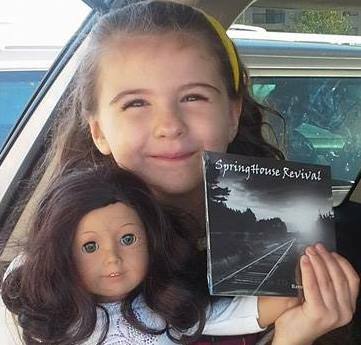 No, the debut CD by SpringHouse Revival (songwriting partner/vocalist Terri Camilari and myself, accompanied by the best studio musicians we could find), has not met the industry standard of selling 500,000 units. At present, we’re about 490,00 — give or take — shy of that mark. All through the process, before the songs were ever mixed and mastered, the music – four years since the stork delivered UPS boxes weighing about 100 pounds each to my front door this past Monday –this music has been Sofia’s choice. Her favorite song on the CD – “Prayin’ Kind” – even bumped both versions of “Let It Go” from the “Frozen” Soundtrack from the top of her hit parade. But she’s not just in love with one song. When she says “put your music on, daddy” – sometimes when even a self-indulgent narcissist such as I aches for a break for some Springsteen or U2 or sports talk – it’s all 14 tracks she wants to hear. She sits in the back, in her little booster seat, and sings the songs with all heart. That heart is my own flesh and blood. Along the way, when a new song was written and its scratch demo (that’s music talk) was recorded, I’d ask Sofia’s opinion while on the way to school. I do this because I know that she, like most second-graders, is a straight-shooter. There are critiques, like the voice isn’t loud enough in the early mix – hindering her ability to sing along – but I’ll explain the process and that it will be taken care of once mixed. Or she’ll say she likes song X, but not as much as song Y. Sometimes, as the primary producer/arranger, I will take these suggestions to heart. It’s not that we’re trying to appeal to the grade-school crowd. Some of the topics of the songs – drug abuse, the Holocaust, lost souls slipping through the unforgiving cracks of our society – are more geared to college-aged ears and beyond. But a hook is a hook – and Terri has a knack for taking my words and giving them musicality – and Sofia is, well, hooked. Sofia has been involved in music programs since she could barely walk. She dances three days a week and plays piano. My wife, Laurie, insists she stick with piano – even on the many weeks when there is a better shot of FOX News saying something positive about the president than there is of getting her to practice – because it develops a part of her brain. More practically, I feel it is early training for the singer-songwriter I sense is burgeoning within her (she has already made up songs). Sharing this amazing ride with her. I did it as much for her as it was to scratch my itch and eliminate an item from the bucket list – more music is coming, as we are a few songs into the next project already and some of the new songs are scary-good. Gold can mean a lot of things to a lot of people. It can mean bling adorning your body. It can mean fat paychecks. It can mean a record in a frame on the wall. For me, it is something wholly different. It is when my 79-year old mother rides shot gun playing air guitar while Sofia belts out the words. It is when Laurie believes in it enough to not pressure me too much into getting a real job, while also looking into educating her attorney self on the dark side of the music business so that Terri and I get what we have coming to us. On the assumption, of course, that anything comes at all. If it does – in the form of a song being placed in a TV show or movie, or another artist with a bigger name wanting to record a song – it will be the kind of high you can find without the legalization of marijuana. If not, I can listen to my daughter sing my words – some of which were written 20-25 years before she was a glint in my eye – and now that it’s all good. This entry was posted in Music, Parenthood, Slice of Life on September 28, 2014 by gordonglantz.